…which was brutally interrupted at 4:30am by my alarm clock, as I had to prepare to drive down to Anderson, SC for the race. Arriving at the race sight at 6am, I had to set out my Transition 2 gear, grab a bus, and head over to the lake. Seated next to another first time Half-Ironmanner, we nervously complained about the length of the swim. I shared that my favorite was the run, and he mistakenly took me for a former cross country runner. At the second transition sight, I shoved myself into the borrowed wetsuit and headed down to the water’s edge. With the official water temperature being 62 degrees, I figured it better not to do a warmup swim but just go in “cold.” After the pros took off, it was our turn. Standing in group of probably 50 guys, there was a gentlemen with just one arm, and a paddle attached to his second arm, just in front of me in the corral. Impressed by his grit (and curious how he was going to do the bike), I was ready when the airhorn blared. The swim went relatively smooth. The buoyancy of the wetsuit helped tremendously as a moved through the water. I wasn’t first, but could also tell I was not last. When I came within 200 yards of the shore, I looked over and saw the first pink swim cap pass me. We got a 10 minute head start on the ladies, but I was still impressed with the overall time of 38 minutes on a 1.2 mile swim. That was far faster than I was averaging on my training swims in a pool. So I give all the credit to the wetsuit. As I jogged into my transition area, I realized one flaw to my training. I never practiced taking off the wetsuit. Now that posed a difficult challenge. Eventually, I got the suit off, and bike clothes on and out the T1 area in 4 minutes 50 seconds. Clearly something I needed to work on. The bike course began with a five mile straight up hill. I churned through the first few miles, when I started to feel the wind. I knew this bike ride was going to be a long, windy and hilly ride. There were times in the ride when my entire bike was pushed over. The first 15 miles where a constant up and down, with a few hard climbs. By mile 15, we passed through what they warned us to be a treacherous curve. As I came down the curve, I noticed a biker on the opposite shoulder pulling branches off of his back. At the bottom of the decent, they had said the climb out was the worst climb of the ride. I quickly got over the climb, and mistakenly thought if that was the worse climb of the day this should not be so bad. Calculating my times, I was surprised at how slow I was going. In the shorter sprint races, I was usually able to get past a few racers on the bike. Today, though I was being passed frequently. Twice my chain dropped, and once I stopped thinking I had dropped it to the inside, which turned out not to be the case. At mile 30, however, my knee–which I had injured on a previous 60 mile ride, started to get sore. The injury would only bother me when I was going uphill on the bike. So I pressed on. 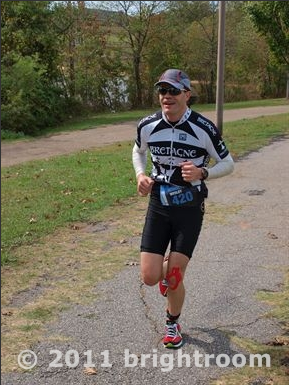 From miles 30-45 the course was fairly flat, but the knee with each pedal stroke was getting more and more painful. Around mile 50, though came the final big climb. I mistakenly thought standing up out of my saddle would get my knee into a better position. This was actually the worst position and it buckled under me. For a moment I thought I was going to have to disembark and push the bike up hills. But slowly (8-9mph) I would pedal my way up the hills and coast down the other side, I started to worry that I might not be able to run. So I drug myself over the final 6 miles. And at the final turn into T2 saw Lindsay, Ellie and the boys waving and cheer. This sight gave me a new boost of energy. As I hit the dismount line, I kicked my leg over the bike seat…and my leg would not get over it. So I stumbled off the bike, and fell into a spectator who graciously caught me and my bike and righted me. Running down to my bike rack, I noticed that the folks around me, miss racked their bikes, and I was slow on the bike I had not place to put my bike. Jamming my bike between two others, I put on my running shoes and headed out. Immediately, I could tell my knee would not be an issue on the run. I had completed the swim and the bike in 4hours, 6 minutes. The bike taking 10 minutes longer than I had expected, but the swim went by much faster. So I started calculating in my head that if I kept a sub 9 mile pace, I actually could break a 6 hour race. The first 4 miles I was running 8:13-8:48 miles. Then the race turned us from the convention center onto Anderson’s main drag and into downtown. With each mile my pace dropped off, and at mile 8 it dropped from a 9:06 to a 9:46. From that point in I knew finishing in under 6 hours was not going to be an option, and that I would miss it by 3 minutes or so. In the final stretch, I turned down the main convention center drag, and was surprised to see that they had us do one more, uphill loop. As I made the turn to climb this final loop at mile 12.9, I hear “Wes!” and wonder how in the world does that race official know my name. Turns out the family had been standing 10 feet from me shouting my name 6 times, I was so out of it and annoyed that they would have us climb one last hill, I blocked out even their encouragement. At 13 mile mark, and .1 miles from the finish, I grabbed Ellie and had her run to the finish line with me. With pure joy we crossed. As the race volunteers approached my daughter and my bent-over-self, I watch them give her my medal…and I think to myself, that was nice of them, but what a cheap rubber medal they are giving us. Then I saw a second volunteer bring over a nice, heavy metal medal, and put it over my head. Ah, much better. The volunteers wisked Ellie away to get her a bottle water and to bring me one as well. From that moment on, if I stood up Ellie stood with me, if I took a sip of water, she sipped hers, when I sat down on the asphalt she was by my side. I think we have found another racer in the Barry family. So the question remains, would I do another one. Hearing the amount of people complain about the wind and the hilliness of the bike course, and how close I was to the 6 hour mark. I do see another race at some point, with a fully healed knee, and a flat beachfront course. Whoever, this Revolution3 group is they run one heck of a race and a family friendly one at that. Save the time and scroll to 8:50 to see me finish. REV3 Triathlon SOUTH CAROLINA 2011 – Age Group Recap from REVOLUTION3 Triathlon on Vimeo. *I would note that the video is sliced up so not all finishers are in their correct order. Plus many of them ran the Olympic distance and not the 70.3…if you catch my drift.